Angel playground have developed many different themes for outdoor playground, we have Ocean theme, California City, Fantasyland, Animal, Pirate Ship, Ice age, Space city, Rocket, Natures, forest and Fancy etc… We offer wide range choice for school and park outdoor play equipment, Kids will be moved by our innovation design and quality play events, we bring play experience to a new level. Angel intensity fitness play structures combine exciting fitness challenges with traditional play system bring maximum fun and exercise for kids. These active and fun structures help parents and educators successfully guide Children in developing and cognizing their physical ability. With our high standard handiwork and plenty choice on components will attract kids to do more exercise and have great fun. Also fun fitness from Angel playground can be easy and precise assemble on ground. With upgrade on material and manufacturing technique, using new standard on plastic and metal components, our play structures in common design can stand on ground for decades. 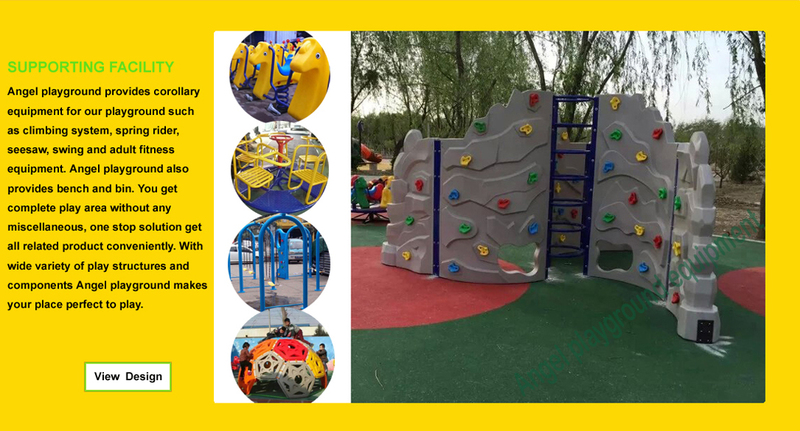 With same function and quality, common playground will be 30% cheaper than themed outdoor play equipment, for school or institution which limited on budget can bring these easeful, stronger, safety and environment protect play equipment for kids to exercise their body and development their social skill. A good theme park should take care kids on different age group also have some project which parents and teenage can do exercise and have fun. We designer will bring your ideal in to new design, contact with us to create a unique and rich in play events park. 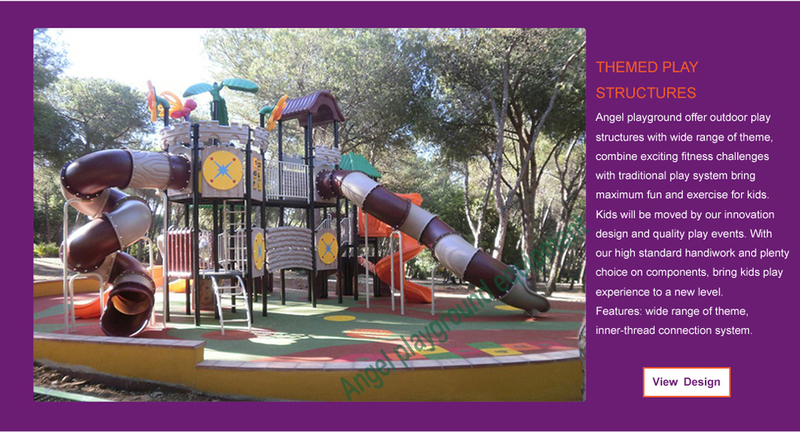 Angel playground constantly innovating to make sure your park outstanding with others, please go through our entire product line chose the favorite play system. 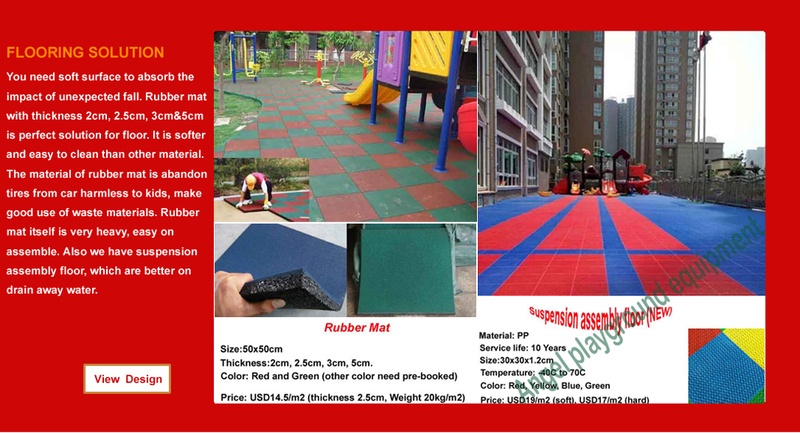 Playground equipment make up the gap between school and practical play time, supporting facility can attract kids do more exercise, can offer more play events for a play center. 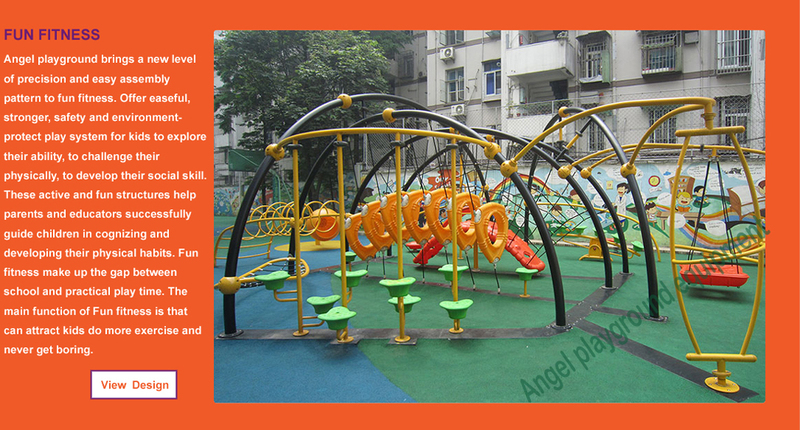 Angel playground have spring rider, climbing wall, swing, seesaw and adult fitness allowed people in different age to get exercise. We also have wooden beach for parents and kids to have good rest. 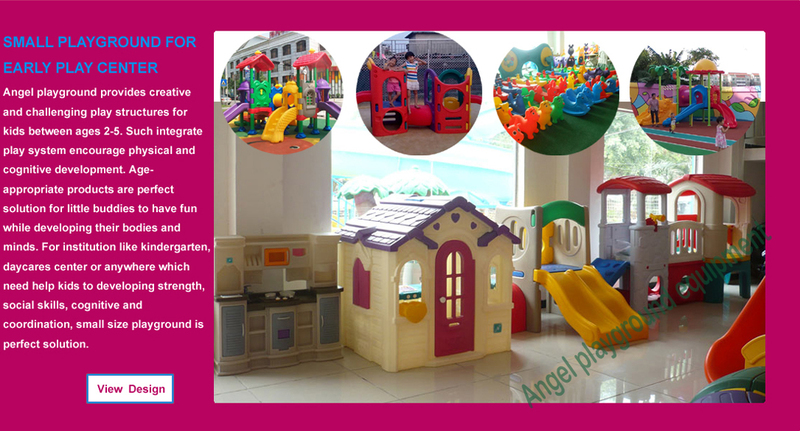 With wide variety of play equipment and components from Angel playground, you get complete play area without any miscellaneous. We make sure you have perfect place for kids to explore! For toddlers, they need Age-appropriate playground which can free to climbing, spinning, swinging, sliding and swaying, Angel playground provides innovative play structures for kids between 2-5 years old. 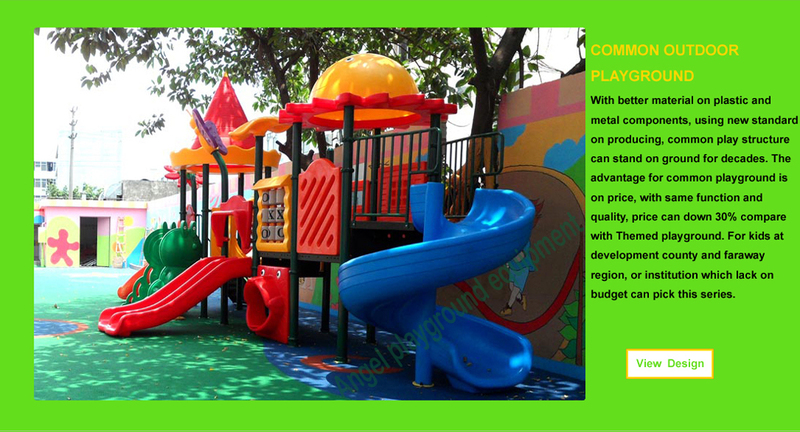 Institution like daycares center, and kindergarten need small size playground which designed only for toddlers, Age-appropriate product can help kids to developing cognitive, coordination, strength and social skills. 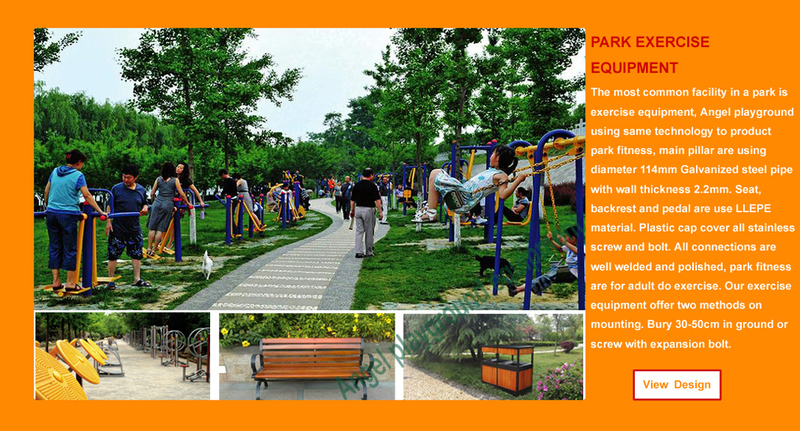 Angel playground using same material and technology to produce fitness equipment for adult do exercise at park. All connections are well welded and polished, rust cleaning by sand blaster machine, painting by high temperature powder backing finish. Seat, pedal and backrest are use LLDPE, Main post are using galvanized steel Diameter 114mm with wall thickness 2.2mm. Plastic caps and stainless screw for mounting on ground or bury in ground. 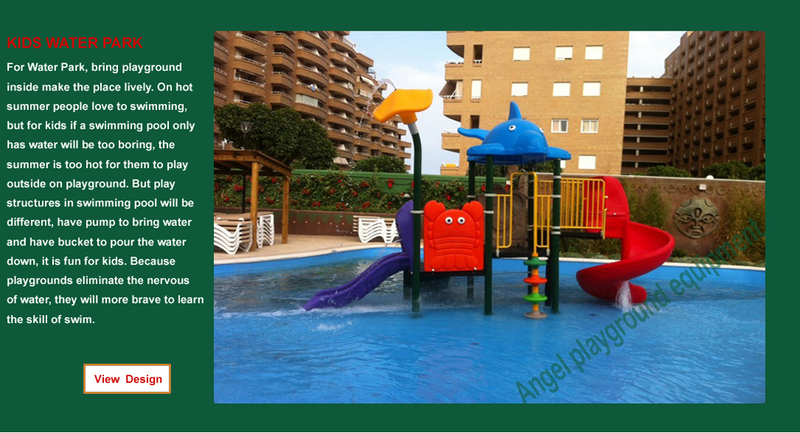 Angel playground offer play structures for kids only in Water Park, with littler change on normal playground slides can suit for kid’s swimming pool perfectly. Assemble water pump inside the main post, water falling down to platform and slide keep the temperature down, Using some bucket on top replace the roof, leading water in the bucket, the bucket will turn over and pour water down once fully and this circulation keep continue. Bring playground in kids swimming pool make the place lively. To guarantee the safety while kids play at playground, you need soft material on ground to absorb the impact of unexpected fall. Contact with us today! 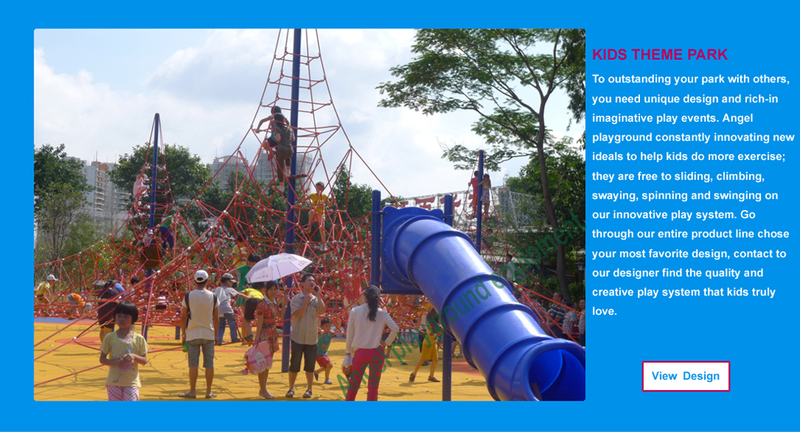 We are pleasure to working with you to create a true adventure playground which can inspire kids.